A large clear skull tilts 30 degrees to the back. The sky is [grid]. The ground is [grid]. The very tiny [grid] "MEMES" is -.8 feet above the skull. The "MEMES" is facing east. 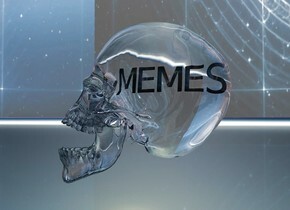 The "MEMES" is -1.49 feet in front of the skull. The light is gold.